Posted on 10, October 2016 by EuropaWire PR Editors | This entry was posted in Awards, Belgium, Chemicals, Education, Science and tagged Ben Feringa, Chemistry for the Future Solvay Prize, Jean-Pierre Clamadieu, Nobel Prize in Chemistry 2016, Solvay. Bookmark the permalink. BRUSSELS, 10-Oct-2016 — /EuropaWire/ — Solvay proudly celebrates that Dutch scientistBen Feringa is among the winners of the Nobel Prize in Chemistry 2016, nearly one year after he won the “Chemistry for the Future Solvay Prize”. Ben Feringa, Professor at the University of Groningen, The Netherlands, won the Nobel Prize jointly with France’s Jean-Pierre Sauvage and Fraser Stoddart of the UK for the design and synthesis of molecular machines. Feringa’s groundbreaking work on unidirectional molecular motors, a research field that paves the way to new therapeutic and technological applications with nanorobots, earned him the Chemistry for Future Solvay Prize in November last year. 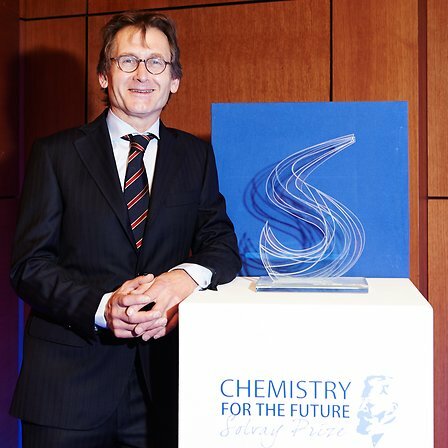 The independent Solvay Prize jury saw in Feringa “one of the most creative chemists of the present day”, an opinion which the Nobel Academy confirmed today. Solvay created the prize in 2013 to celebrate its creation 150 years earlier by Ernest Solvay and to perpetuate his commitment as a dedicated and inspired supporter of scientific research. The prize of € 300,000 aims to recognize every other year a major scientific discovery that lays the foundation of the chemistry of the future while promoting human progress.